The BBC has again voiced concern for the safety of its Gaza reporter, Alan Johnston, after the release of a tape purportedly made by his kidnappers. 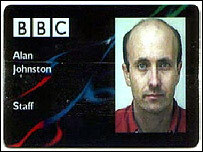 The tape has no fresh pictures of Mr Johnston but shows his BBC ID card and contains a demand for the release of Muslim prisoners in British jails. The BBC's Deputy Director General Mark Byford renewed calls for Mr Johnston to be released unharmed. Mr Johnston, 44, was seized at gunpoint in Gaza City on 12 March. "Fifty-nine days after he was abducted, our sole concern is for Alan's welfare and for that of his family," Mr Byford said. "What we and they want more than anything else is Alan's safe return." He said the BBC welcomed any sign that its reporter may be alive and well and he hoped "today's news may be a sign that Alan will soon be safely released". 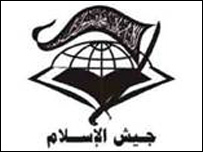 The tape was delivered to the Gaza office of the al-Jazeera TV network and was made by a group calling itself Jaish al-Islam (Army of Islam). It specifically demands the release of Abu Qatada, a Palestinian-born Islamic cleric who is suspected of close links to al-Qaeda and is currently held by the UK government as a threat to national security. Until now, the kidnappers have not made their demands public or made any contact with the media. In April, the previously unheard of Tawhid and Jihad brigades claimed it had executed Mr Johnston, though that claim could not be verified. The Palestinian government says it has received information that Mr Johnston is alive, and it is working for his release. The BBC's World Affairs correspondent Mike Wooldridge says not much is known about The Army of Islam, but that it is an established Palestinian group. He adds that if the tape is authentic, then it does represent a development in the lengthiest kidnapping of a Westerner to take place in Gaza. News of the tape emerged hours after a senior UK diplomat held talks with Palestinian Prime Minister Ismail Haniya as part of the effort to secure Mr Johnston's release. Consul-General Richard Makepeace, who is based in Jerusalem, said Mr Johnston's continued captivity remained of "great concern" to the UK. There have been high-level appeals for his freedom, including from Tony Blair and the United Nations Secretary, General Ban Ki-moon. Mr Johnston joined the BBC World Service in 1991 and has spent eight of the last 16 years as a correspondent, including periods in Uzbekistan and Afghanistan. He has lived and worked in Gaza for three years and was the only Western reporter permanently based in the often violent and lawless territory.